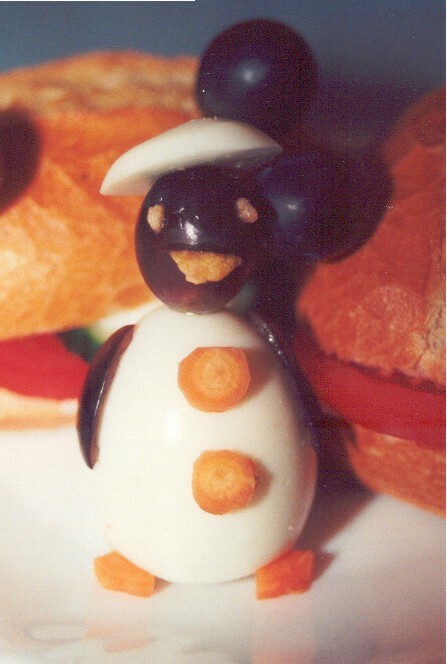 This penguin is made of a boiled egg, decorated with carrot legs. The head and wings are made of black grapes. The head is pinned up with a toothpick. On the belly you can see 2 buttons out of carrot. The bill and eyes are made of cornflakes. It was a big surprise from my children on Mother's Day, August 2000. This recipe is a translation from the German, with permission from © Gerda Aurich. Thanks for letting me add it here. 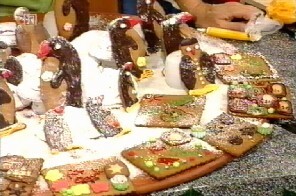 Original picture of the television broadcast "Schlawiner Platz"
At first you make a penguin shaped template, like shown on the picture. Place the penguin template on the dought and cut out with a sharp knife. Cut as many figurines as possible. Put on the baking sheet and place in a preheated oven. Bake them for 10 à 12 minutes at a temperature of 200 °C. Carefully, because too hard baked figurines taste bitter. Cool out on a wire rack. Stir the icing sugar with the lemon juice. Color half of it with red and the other half with yellow food coloring. Decorate the penguins: red for the bill and yellow for the feet. 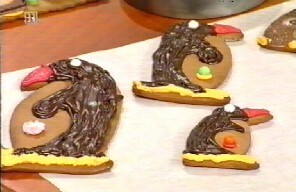 Use the chocolate icing for the flippers and back. Make eyes with the sugar pearls. Cool it all. Break the meringues and build an iceberg. 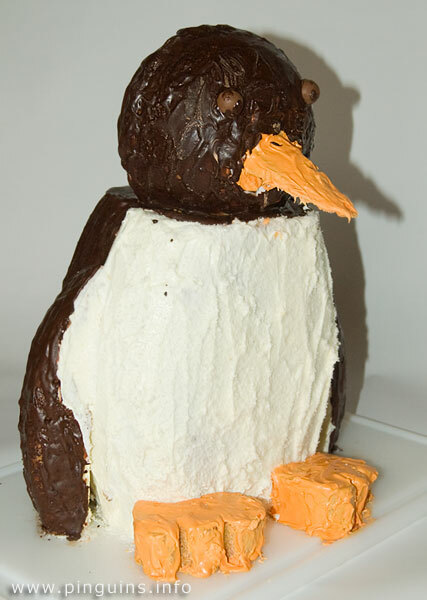 Place the penguins on it and dredge with powdered or icing sugar. This cake is made by my daughter Femke as a surprise, and she worked for days. 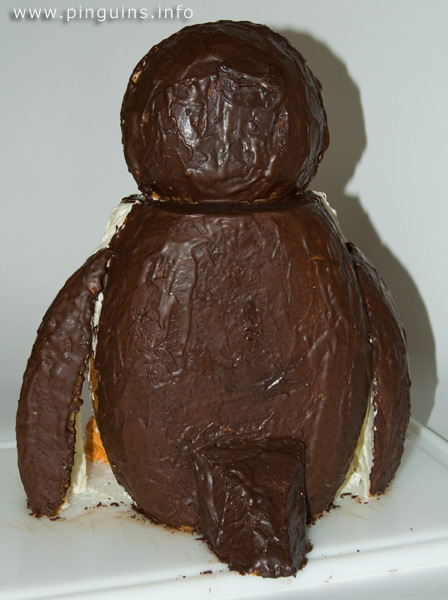 It was a shame to cut the penguin in pieces, but nevertheless it tasted very yummy. Separate the yolk from the (egg) white and beat the egg whites until stiff. Mix the butter, sugar and egg yolk, beat until light and foamy. Add sifted flour and stiff egg whites. Pour into prepared cake pan; smooth top. Bake in a preheated oven for an hour at 150-170°C (300 till 350 degrees F) or until center of cake springs back when lightly touched. Depending on the size of the penguin, you use larger or smaller baking tin. 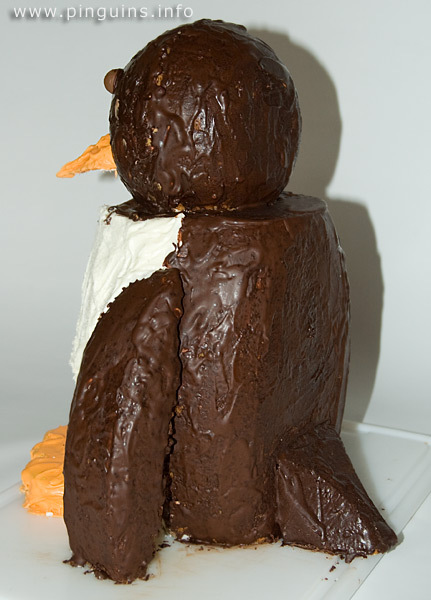 Here she used 10 times the ingredients and the penguin was about 30 cm tall and 20 cm wide. 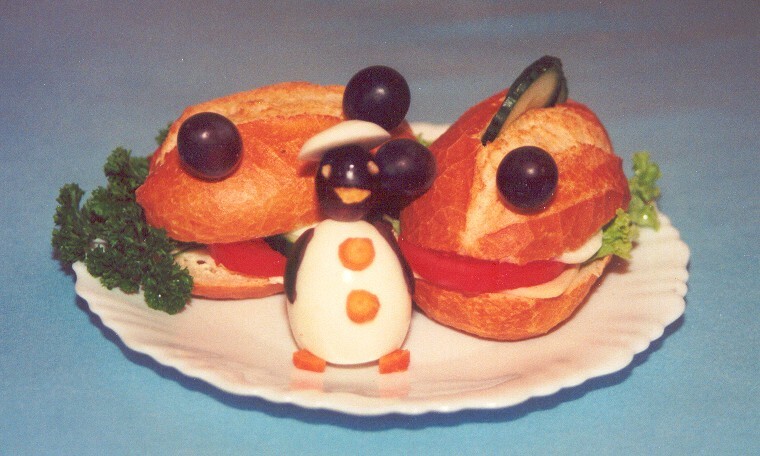 There was sufficient to serve 40 till 50 persons, so it could be an original idea for a birthday party of a penguinlover. By cutting the right shape, there were a lot of left overs, which can be tasted during the preparation time. For the belly you take two oval oven dishes, cut them off on the side and glue them together with a mixture of powdered sugar and water. The head is made of two half spheres and glued together to a ball. The flippers are cut of out of another oval form (oven dish) and the feet out of a flat rectangle tin. The tail and bill are also made out of a large form. The parts are glued together with food glue: a mixture of icing (powdered) sugar and water. To make it less sweet you can add a bit of lemon juice too. Make sure the flippers are long enough to rest on the base, because they are heavy and can easily break loose. To apply the bill, make a hollowing-out to fit in and fix it with toothpicks when necessary. The eyes are two malteser chocolate balls. Decorate with instant icing, or you can make it yourself by mixing icing sugar and water. Or, depending on your taste, you can make butter cream. Color the icing or cream with food colouring. Red, blue, yellow and green can be found in large food stores. As black food colors don't exist (couldn't find any), use chocolate powder and mix it with the icing to darkbrown. The orange is a mixture of red and yellow. To give the belly a feather look, powder it with shredded coconut and spread the icing in the right direction.
! 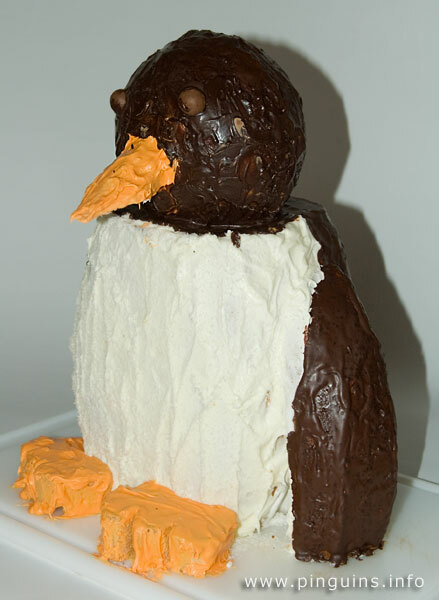 Enjoy your penguin cake !